Words like ‘momentous’ and ‘historic’ slip easily off the tongue, Justifying their use often proves to be much harder. For The European Brain Council (EBC), however, 2011 was just that – momentous, historic and a perfect launch pad for tackling the challenges ahead. Over the past 12 months, the EBC’s activities have attracted more attention and media coverage than ever before. Two major European Presidency meetings were supplemented by two benchmark publications. 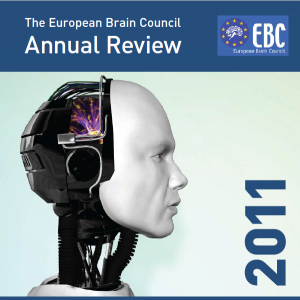 More National Brain Councils have been established, while plans for the 2014 European Year of the Brain continue to gather both support and momentum. in Europe. Equally, it is perfectly placed to drive the agenda in improving the quality of life for all those affected by brain diseases. During 2011, its voice has become increasingly loud and influential, to the point, indeed, where it is coming to be regarded as the primary commentator on such issues.